After cancer and heart diseases, stroke is becoming the major leading cause of death which produces huge hopelessness among the patients all through the world. Stroke is an essential general prosperity concern, being among the most broadly perceived explanations behind impairment and death. The impedances of cerebral are most inescapable of all lacks seen in stroke. The motor loss is mixed the relationship of cranial nerves, muscle control, and tone, walk, coordination, apraxia, and reflexes. The paralysis of the upper extremity is the run of the mill and objectionable results of paraplegic which upsurges activity confinement. Normally, the recovery of a paraplegic is less than the loss strategy of slower cutoff work. In stroke upper limb brokenness is depicted by paresis, manual loss of smoothness, and improvement varieties from the standard that may influence astonishingly on the execution of activities of daily livings. Understanding, holding, and controlling articles are step-by-step works that stay lacking in 45%–65% of patients 2–6 months poststroke. Task-oriented approach enhances the communication between large frameworks in the cerebral cortex and is used to achieve an objective and regarded to the Earth (Shumway Cook and Woollacott 2001). Assignment arranged preparing incorporates an extensive variety of intercessions. What's more, utilize is made of arm preparing utilizing practical undertakings, for example, getting a handle on articles, and constraint-induced movement therapy (CIMT). This preparing is an assignment and patient-centered and not physio centered. The perfect measure of stroke therapy is not exactly known for the stroke patients. The exercise session is habitually picked regularly and not necessary to take in a given capacity (Kwakkel 2006). The effects of treatment power expanded treatment commitment of no. under 14–16 h 7 days positively influences the change of functional activities of daily routine (Kwakkel et al. 2004b). In any case, medicinal orderlies give industrious and encouraged care to stroke survivors regularly on daily basis and would expect a fundamental part in the relearning mechanism. For the most part, undertaking focused restoration after stroke has ended up being compelling and important for nursing rehearse. Change of impedances has for some time been viewed as an essential for utilitarian development, yet intercessions to accomplish such change do not characteristically extend to practical change as the relationship among users and research center measures is for the most part feeble. A broad study of interventions, for instance, helpful change gets ready in the middle of coming to practices for physical fitted to the patients organized exertion to various specialists. As a general rule, the effects of such undertaking centered get ready projects given by restorative orderlies as a group with other therapeutic administrations specialists ought to be measured. To compare the different types of techniques, one is task-oriented and other is constrained-induced movement therapy in stroke rehabilitation. Constrained-induced movement therapy approach combined with a task-oriented approach to improving upper limb functioning in subacute stroke patients. This study was carried out for recognizing the understanding of different treatment approaches to improve paralytic upper limb functions in stroke patients, which may give sufficient information to strategize the measures to improve it further. This study was based on the randomized clinical trial. In this study, simple random sampling technique was used and 40 participants (males and females) were taken, who fulfils the criteria [Table 1]. They randomly included 20 patients in Group A (task-oriented movement therapy) and 20 in Group B (constrained-induced movement therapy), using Lottery method. The measurement was taken at baseline, at 1 and 2 months. The data were collected from Avicenna Medical College, hospital and Adil hospital of Lahore. All the patients were residents of many cities of Punjab, who voluntarily allowed for this study. Ethical review committee approved the study plan according to the Declaration of Helsinki. Forty patients with stroke who fulfilled the consolidation criteria were fused into the examination. Pretest readings were recorded. Patients in control gathering (Group A) were being treated with errand organized program in the wake of picking goals for reclamation medicinally by physiotherapist himself. Immediately, the counselor assessed the patients, perceived their issues and after that set the goals for recuperation fittingly. By then task-orchestrated getting ready was given for 40 min for each session. In the experimental social event (Group B), constraint-induced movement therapy approach was used as a piece of characterizing the destinations. Here, the task-oriented treatment with the patients and their relative as the pioneer and executed treatment in light of the destinations and necessities perceived by the patients themselves. In the wake of picking the goals, undertaking centered program was given to the patients to redesign the physical execution portions that were be perceived by the patients as “basic” according to the COPM  and AART. Following 2 months of intervention, patients were again be evaluated with action research arm test. Frequency tables, pie charts, and bar charts were used to show a summary of responses by the participants of task-oriented and constraint-induced movement therapy approaches. The data were analyzed using SPSS interpretation 16.0 (SPSS for Windows, SPSS Inc., Chicago, IL, USA) programming pack. Clear estimations were used for subject's measurement qualities. The p-regard was set at 0.05. Friedman ANOVA/repeated measure ANOVA was used to examinations any important refinement within each treatment gathering. Coordinated t-test was used to separate inside social event examination of any two consecutive readings. Out of 40 participants, 20 were male and 20 were female. 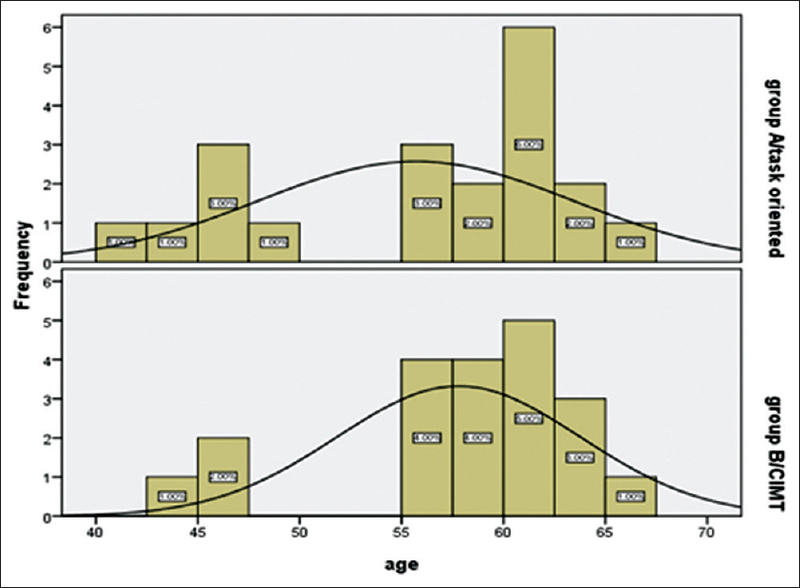 The age ranges from 40 to 70 years of age [Figure 1]. At baseline, there was no difference between the two groups. Mean pre-grip of the Group A participated in this study was χ2 = 5.40 ± 4.083, whereas the mean grip after 1 month was χ2 = 5.25 ± 4.129 and the mean grip of Group A after 2 months was χ2 = 6.00 ± 3.942. Mean pre grip of the Group B participated in this study was χ2 = 5.40 ± 4.083, whereas the mean grip after 1 month was χ2 = 6.60 ± 3.455 and the mean grip of Group B after 2 months was χ2 = 8.10 ± 2.936 [Figure 2]. At baseline, there was no difference between the two groups. Mean pregrasp of the Group A participated in this study was χ2 = 5.87 ± 4.083, whereas the mean grasp after 1 month was χ2 = 5.90 ± 4.129 and the mean grasp of Group A after 2 months was χ2 = 6.1 ± 3.942. Mean pregrasp of the Group B participated in this study was χ2 = 5.28 ± 4.083, whereas the mean grasp after 1 month was χ2 = 5.88 ± 3.455 and the mean grasp of Group B after 2 months was χ2 = 6.65 ± 2.936 [Figure 2]. Results show that for Group A pre-pinch mean was χ2 = 1.50 ± 1.539, after 1-month pinch mean was χ2 = 1.80 ± 1.508 whereas after 2 months pinch mean was χ2= 2.60 ± 2.303. For Group B, the pre-pinch mean was χ2 = 1.65 ± 1.531, after 1-month pinch mean was χ2 = 2.55 ± 1.468 and after 2 months pinch mean was χ2 = 5.40 ± 2.303 [Figure 2]. Group A participants have mean of pre-gross motor χ2 = 5.40 ± 3.016 after 1-month gross motor mean was χ2 = 5.60 ± 2.557 and after 2 months mean was χ2 = 6.80 ± 2.042. For Group B, pre-gross motor mean was χ2 = 5.40 ± 3.016, after 1 month means for the gross motor was χ2 = 6.75 ± 1.916 and after 2 months gross motor mean was χ2 = 8.70 ±0.923 [Figure 2]. Group A participants had a mean difference of pre-gross motor (I-J) = −2.40 after 1-month gross motor mean was = −1.50 and after 2 months mean was = 1.50. For Group B, pre-gross motor mean difference was (I-J) =-3.30 after 1 month means for the gross motor was = −1.95 and after 2 months gross motor mean was = 1.95 [Table 2]. An extraordinary number of looks into have been done to evaluate the impacts of constraint-induced movement therapy (CIMT) for upper appendage hemiparesis after stroke. 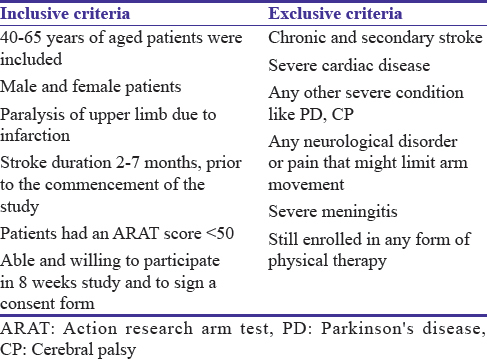 The primary goal of this examination was to look at between task-oriented and constraint-induced movement therapy (CIMT) approaches to improve upper limb functioning in stroke patients for that aggregate 40 members (males and females) 20 in each gathering, with their first stroke were incorporated and 20 members were incorporated into amass A which was errand arranged and 20 members were incorporated into assembling B which was constraint-induced movement therapy gathering. Mean pre-grip of the group A participated in this study was χ2 = 5.40 ± 4.083, whereas the mean grip after 1 month was χ2 = 5.25 ± 4.129 and the mean grip of group A after 2 months was χ2 = 6.00 ± 3.942. Mean pre-grip of the group B participated in this study was χ2 = 5.40 ± 4.083, whereas the mean grip after 1 month was χ2 = 6.60 ± 3.455 and the mean grip of group B after 2 months was χ2 = 8.10 ± 2.936 [Figure 2]. These results show that mean grip improvement was more in constraint-induced movement therapy group as compared to the task-oriented group as observed previously. Constraint-induced movement therapy is labeled as the gold standard in one of the randomized controlled trial (RCT) in which those patients were included who had stroke more than 3 months in those patients the results were significant positive medium effect sizes reported for an arm and hand activities. In the current study, results show that for group A participated in this study was χ2 = 5.87 ± 4.083, whereas the mean grasp after 1 month was χ2 = 5.90 ± 4.129 and the mean grasp of group A after 2 months was χ2 = 6.1 ± 3.942. Mean pre-grasp of the group B participated in this study was χ2 = 5.28 ± 4.083, whereas the mean grasp after 1 month was χ2 = 5.88 ± 3.455 and the mean grasp of group B after 2 months was χ2 = 6.65 ± 2.936. This indicates that constraint-induced movement therapy group showed better results. The study finding exhibits that constraint-induced movement therapy is a potential treatment for upgrading motor limit of upper limb and activities of step-by-step living in patients with stroke. The constraint-induced movement therapy was persisted by the patients in spite of the way that it is a serious program. How do stroke units improve patient outcomes? A collaborative systematic review of the randomized trials. Stroke Unit Trialists Collaboration. Stroke 1997;28:2139-44. Dhamija RK, Mittal S, Bansal B. Trends in clinico-epidemiological correlates of stroke in the community. J Indian Acad Clin Med 2000;1:27-31. Gialanella B, Bertolinelli M, Lissi M, Prometti P. Predicting outcome after stroke: The role of aphasia. Disabil Rehabil 2011;33:122-9. Barreca S, Wolf SL, Fasoli S, Bohannon R. Treatment interventions for the paretic upper limb of stroke survivors: A critical review. Neurorehabil Neural Repair 2003;17:220-6. Trialists'Collaboration Stroke Unit. Organised inpatient (stroke unit) care for stroke. Cochrane Database Syst Rev 2001. Sveen U, Bautz-Holter E, Sødring KM, Wyller TB, Laake K. Association between impairments, self-care ability and social activities 1 year after stroke. Disabil Rehabil 1999;21:372-7. Yavuzer G, Selles R, Sezer N, Sütbeyaz S, Bussmann JB, Köseoğlu F, et al. Mirror therapy improves hand function in subacute stroke: A randomized controlled trial. Arch Phys Med Rehabil 2008;89:393-8. Wolf PA, D'Agostino RB, Belanger AJ, Kannel WB. Probability of stroke: A risk profile from the Framingham study. Stroke 1991;22:312-8. Redfern MS, Jennings JR, Martin C, Furman JM. Attention influences sensory integration for postural control in older adults. Gait Posture 2001;14:211-6. Charles J, Gordon AM. A critical review of constraint-induced movement therapy and forced use in children with hemiplegia. Neural Plast 2005;12:245-61. Winstein CJ, Miller JP, Blanton S, Taub E, Uswatte G, Morris D, et al. Methods for a multisite randomized trial to investigate the effect of constraint-induced movement therapy in improving upper extremity function among adults recovering from a cerebrovascular stroke. Neurorehabil Neural Repair 2003;17:137-52. Page SJ, Levine P. Modified constraint-induced therapy in patients with chronic stroke exhibiting minimal movement ability in the affected arm. Phys Ther 2007;87:872-8. Miltner WH, Bauder H, Sommer M, Dettmers C, Taub E. Effects of constraint-induced movement therapy on patients with chronic motor deficits after stroke: A replication. Stroke 1999;30:586-92. Law MC, Baptiste S, Carswell A, McColl MA, Polatajko HJ, Pollock N. Canadian Occupational Performance Measure. Toronto: Canadian Association of Occupational Therapists; 1998. Schaechter JD, Kraft E, Hilliard TS, Dijkhuizen RM, Benner T, Finklestein SP, et al. Motor recovery and cortical reorganization after constraint-induced movement therapy in stroke patients: A preliminary study. Neurorehabil Neural Repair 2002;16:326-38. Grotta JC, Noser EA, Ro T, Boake C, Levin H, Aronowski J, et al. Constraint-induced movement therapy. Stroke 2004;35:2699-701. Blanton S, Wolf SL. An application of upper-extremity constraint-induced movement therapy in a patient with subacute stroke. Phys Ther 1999;79:847-53. Wolf SL, Thompson PA, Winstein CJ, Miller JP, Blanton SR, Nichols-Larsen DS, et al. The EXCITE stroke trial: Comparing early and delayed constraint-induced movement therapy. Stroke 2010;41:2309-15. Dromerick AW, Lang CE, Birkenmeier RL, Wagner JM, Miller JP, Videen TO, et al. Very early constraint-induced movement during stroke rehabilitation (VECTORS): A single-center RCT. Neurology 2009;73:195-201. Stroke Unit Trialists' Collaboration. Organised inpatient (stroke unit) care for stroke. Cochrane Database Syst Rev 2007;4:CD000197. Page SJ, Sisto S, Levine P, McGrath RE. Efficacy of modified constraint-induced movement therapy in chronic stroke: A single-blinded randomized controlled trial. Arch Phys Med Rehabil 2004;85:14-8. Hakkennes S, Keating JL. Constraint-induced movement therapy following stroke: A systematic review of randomised controlled trials. Aust J Physiother 2005;51:221-31. Hakkennes SJ, Brock K, Hill KD. Selection for inpatient rehabilitation after acute stroke: A systematic review of the literature. Arch Phys Med Rehabil 2011;92:2057-70. Jonsdottir J, Cattaneo D, Recalcati M, Regola A, Rabuffetti M, Ferrarin M, et al. Task-oriented biofeedback to improve gait in individuals with chronic stroke: Motor learning approach. Neurorehabil Neural Repair 2010;24:478-85. Jang SH, Kim YH, Cho SH, Lee JH, Park JW, Kwon YH, et al. Cortical reorganization induced by task-oriented training in chronic hemiplegic stroke patients. Neuroreport 2003;14:137-41. Rensink M, Schuurmans M, Lindeman E, Hafsteinsdóttir T. Task-oriented training in rehabilitation after stroke: Systematic review. J Adv Nurs 2009;65:737-54.